On 23 June 51.9% of those who took part in the Referendum voted that they wish to leave the EU. Approximately 72% of the electorate voted – in other words 37% of the adult population of the UK said they want to leave the EU and only those in England and Wales had a majority in favour of leaving. Interestingly, the percentage wanting to remain in Scotland and Northern Ireland was higher than that for leaving in England & Wales (and in Gibraltar the remain vote was 95%). The Referendum Act does not say clearly what happens next. 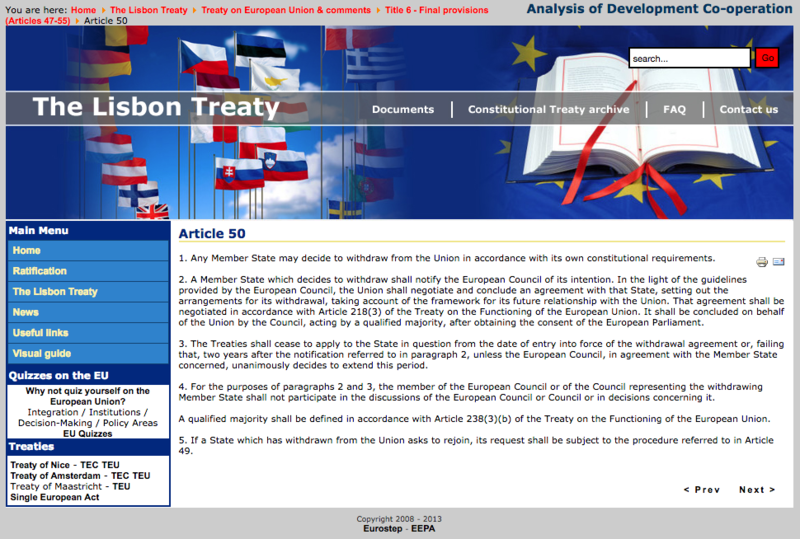 Article 50 of the Lisbon Treaty says that any Member State may decide to withdraw from the Union ‘in accordance with its own constitutional requirements’. It then has to give notice of its intention to withdraw to the European Council. As the UK does not have a written constitution, and Parliament is where our decisions are made, it is for Parliament to decide whether and when to give that notice to the EU. However, some think the Government can give the notice without the need for a vote of the House of Commons. Since the referendum result does not itself have the force of law and this is perhaps the biggest decision the UK has to make, it would be strange for the Government of the day (especially a different Government from the one that took office at the last General Election) to make the decision without the approval of Parliament. This issue is likely to be decided by the courts, as legal steps are already being taken to ensure the UK Government will not trigger the procedure for withdrawal from the EU without an Act of Parliament. Article 50 then says that, once the notice is given, the EU will ‘negotiate and conclude an agreement with that State, setting out the arrangements for its withdrawal, taking account of the framework for its future relationship with the Union’. The UK will then withdraw from the EU on the date the withdrawal agreement comes into effect or, failing that, two years after the notification, unless an extension of that two year period is agreed. The agreement needs to be approved on behalf of the Union by the Council, acting by a qualified majority, after obtaining the consent of the European Parliament. Until the withdrawal is final, the UK remains a member of the EU and bound by its laws, but not able to take part in discussions on its withdrawal. This entry was posted in Brexit and tagged article 50, brexit law, referendum act. Bookmark the permalink. Handshake contracts are valid. The Anglo-Saxon system is not the same as the system here in Central Europe.